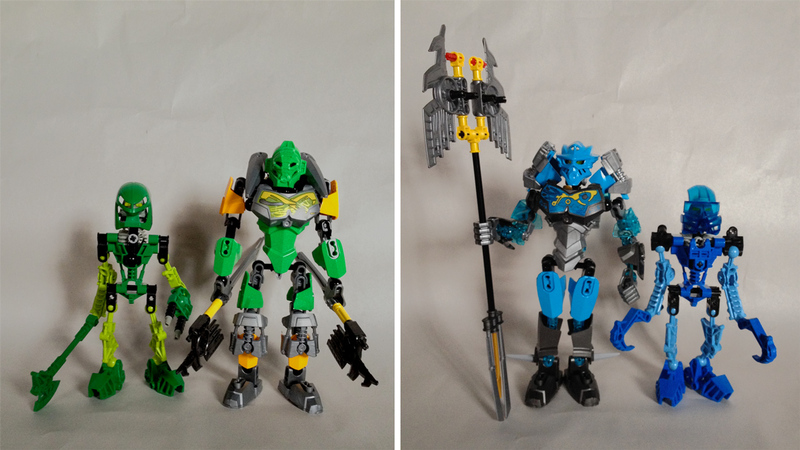 The new designs in Lewa Master of Jungle are fairly typical of the new Toa. He includes two of the new piston detail piece in Silver Metallic (Design ID 19087 | Element ID 6102789), the new Technic gearbox frame in Dark Stone Grey (Design ID 19086 | Element ID 6102645), the new head in Silver Metallic (Design ID 19049 | Element ID 6102606), and the new eye/brain stalk in Transparent Fluorescent Green [TLG]/Trans-Neon Green [BL] (Design ID 19050 | Element ID 6102639). Specific to Lewa are the new Titanium Metallic [TLG]/Pearl Dark Gray [BL] axe blade pieces (Design ID 19089 | Element ID 6104152). 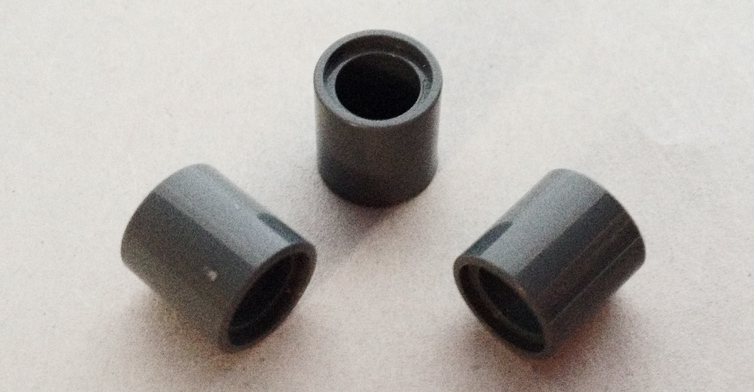 Lewa also includes two (plus one extra) of this new Dark Stone Grey [TLG]/Dark Bluish Gray [BL] Technic bushing (The Design ID is not molded into the piece but the Element ID is 6100030). Unlike most previous bushings, it includes a pin hole rather than an axle hole, meaning that on a functional level it is similar to the earlier design 6221. However, it is a full module thick (the old version was .16 millimeters shorter) and has perfectly smooth sides. Also specific to Lewa are the Mask of Jungle in Bright Green (Design ID 19061 | Element ID 6102750) and Warm Gold [TLG]/Pearl Gold [BL] (Element ID 6102752). 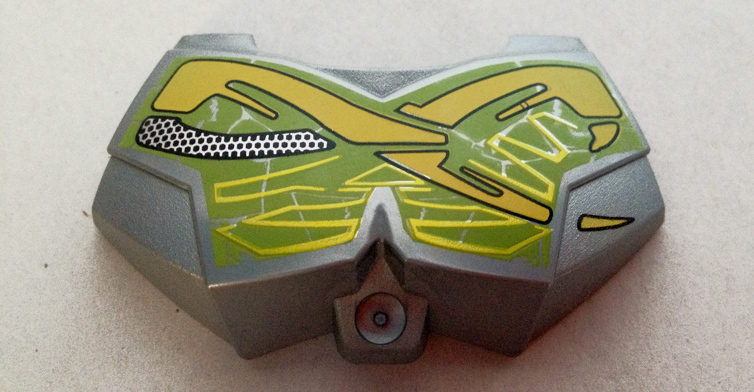 This mask has had mixed reception in the BIONICLE fan community since it’s one of the most different from the original Dark Green [TLG]/Green [BL] Kanohi Miru (Design ID 32565 | Element ID 4143780) worn by set 8535 Lewa in 2001. 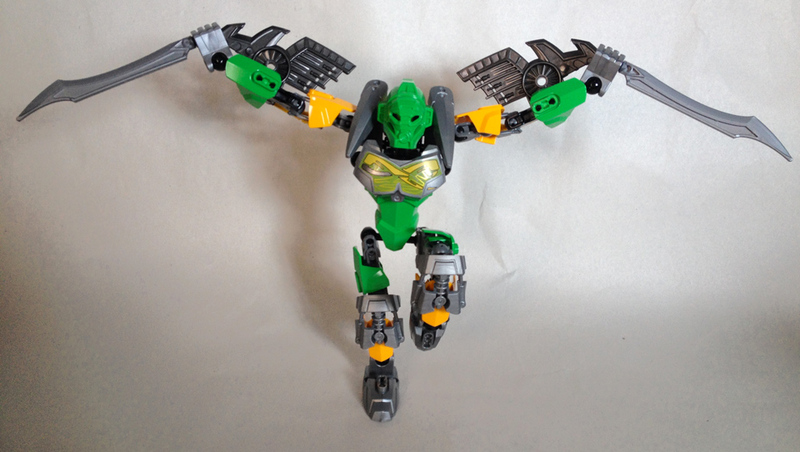 The original Kanohi Miru granted Lewa the power of Levitation, but the Mask of Jungle instead grants him elemental jungle powers — what those powers might be remains to be seen. Some of the original mask’s hallmarks are still present, like the holes on either side of the mouth that evoke a playful grin, but other things have been radically altered. Gone is the original mask’s protruding nose/beak, replaced by a more spherical curve with a layered texture. The eyes have been made considerably smaller, and the mask has gained air intakes on the top and sides. 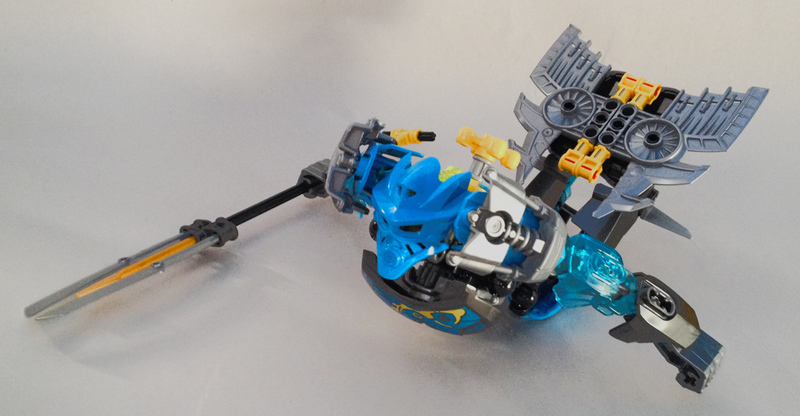 Some of these changes might have been made to evoke 8567 Lewa Nuva’s Miru Nuva (Design ID 43614 | Element ID 4175745), an enhanced version of the Kanohi Miru released in 2002, and particularly its distinctive appearance in the movie BIONICLE: Mask of Light. Gali’s new designs are mostly the same as Lewa’s. although she doesn’t feature any of those new bushings. Instead of Titanium Metallic, her axe blades are Silver Metallic [TLG]/Flat Silver [BL] (Design ID 19089 | Element ID 6102795). Their molded turbines will demonstrate their significance in the mobility-oriented Adrenalin Mode of both sets. Gali includes a Mask of Water in Dark Azur [TLG]/Dark Azure [BL] (Design ID 19062 | Element ID 6102755) and Warm Gold (Element ID 6102757). Gali’s original mask, the Kanohi Kaukau, granted her the power of Water Breathing. The new mask instead grants her elemental water abilities, but water breathing might still be one of these abilities. 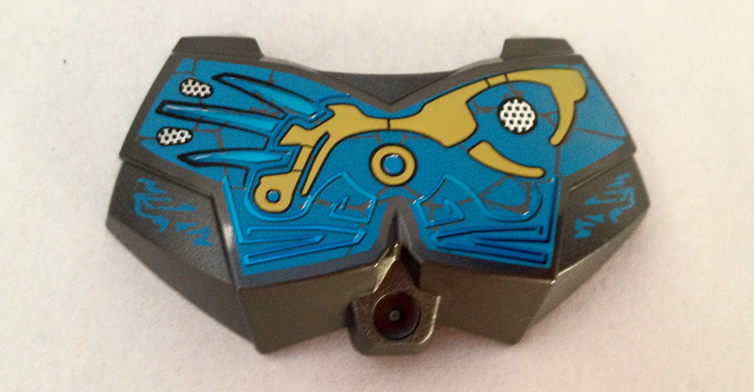 Aesthetically, the biggest differences the Mask of Water has from the classic Transparent Blue [TLG]/Trans-Dark Blue [BL] Kanohi Kaukau (Design ID 32571 | Element ID 4143784) are its color and the fact that it has actual eyeholes rather than a transparent visor. As with Lewa’s Mask of Jungle, a lot has been said of this mask’s differences from the original, but in a side-by-side comparison I was actually struck by the similarities, particularly in the curve of the forehead when viewed from the side. From front view, the mask’s forehead takes on the appearance of streamlined ridges similar to those of 8570 Gali Nuva’s Bright Blue [TLG]/Blue [BL] Kaukau Nuva (Design ID 43856 | Element ID 4175743). The outline of a visor like the one on the classic mask is apparent from front or side view, and likewise the vents in the cheeks have an analogue in most previous versions of the mask. The triangular mouth area is another hallmark of the original Kanohi Kaukau. However, the chin has been made less square than either of these previous masks, lending the mask a more feminine appearance. And the mouth and nose area protrudes less when viewed from the side. Each set of course includes a Skull Spider. The body of the Gali set’s Skull Spider is Silver Metallic (Design ID 20251 | Element ID 6106710), as with the other Ice and Water sets, while the body of the Lewa set’s Skull Spider is Earth Blue [TLG]/Dark Blue [BL] (Element ID 6106709), as with the other Air and Stone sets. Each has four Titanium Metallic legs (Design ID 20252 | Element ID 6106738). The Skull Spider is nothing special from a construction standpoint, but boosts the play value of each set by giving the Toa an enemy to fight. These sets are awash in recolored elements. Lewa includes four Flame Yellowish Orange [TLG]/Bright Light Orange [BL] 4M shells (Design ID 14533 | Element ID 6102853), and four Bright Green shells of the same design (Element ID 6108829). He also features three Silver Metallic 7M talons (Design ID 15362 | Element ID 6102809). Gali merely includes four Dark Azur 5M shells (Design ID 90639 | Element ID 6102833). She also includes two each of the Tr. Light Blue 5M beams and 7M beams I mentioned in my Kopaka review — not new in this color, but probably new to a lot of North American buyers since the 2014 Legends of Chima constraction sets they originated in were not released here. Lewa’s Silver Metallic chest plate (Design ID 98603 | Element ID 6103763) is the part’s first appearance in that color. The pattern is a bit peculiar as it features mainly Bright Yellowish Green [TLG]/Lime [BL] and Bright Yellow [TLG]/Yellow [BL] printing instead of the two more prominent colors in the set’s color scheme, Bright Green and Flame Yellowish Orange. However, it still looks very elegant and complements the set nicely. It features elegant metallic gold zigzags as well as a metallic silver vent on the right side. Gali’s Titanium Metallic chest plate (Design ID 98603 | Element ID 6104401) is not new in this color, but its pattern might be my favorite so far. The bright yellow “war paint” is nothing if not elaborate, and the three metallic silver vents are placed asymmetrically. The part features a Dark Azur backdrop and metallic blue zigzag patterns that call to mind cascading waves. 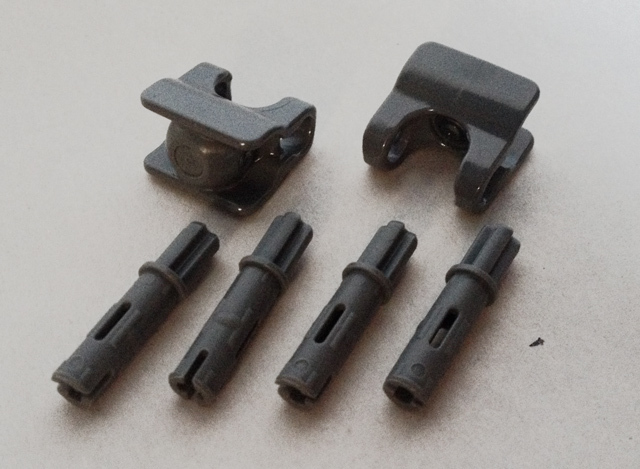 As far as other useful or noteworthy parts are concerned, Lewa features four Dark Stone Grey 3M Technic friction pin/axle pieces (Design ID 11214 | Element ID 6015316). This part debuted this year and already appears in 23 sets, but this might be some people’s first set to include them. Lewa also features two Dark Stone Grey high-friction ball cups (Design ID 74261 | Element ID 6106472), a perennially useful constraction element I previously mentioned in my Kopaka review. 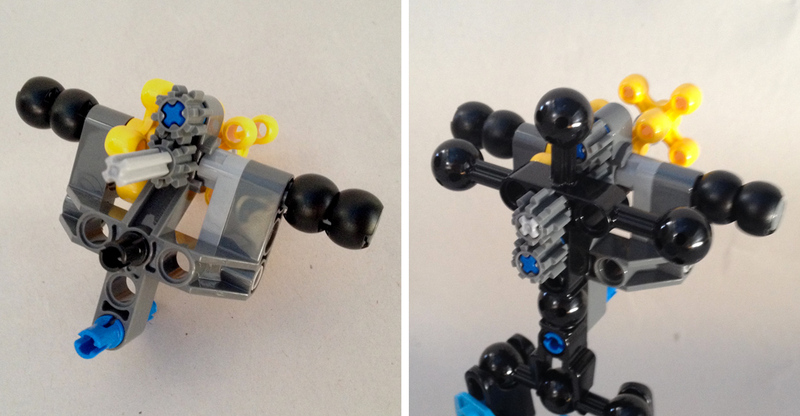 Gali doesn’t have either of these parts, but she does have a Dark Stone Grey 3M Technic beam with center ball (Design ID 98577 | Element ID 6001085), two 10M Silver Metallic blades from the Ninjago theme (Design ID 98137 | Element ID 4654422), two Medium Stone Grey 3M fin/spike pieces (Design ID 64727 | Element ID 4616840), and a Titanium Metallic 2x3 connector block (Design ID 11272 | Element ID 6022718). I also ought to mention her Warm Gold minifigure spear (Design ID 4497 | Element ID 4600529). 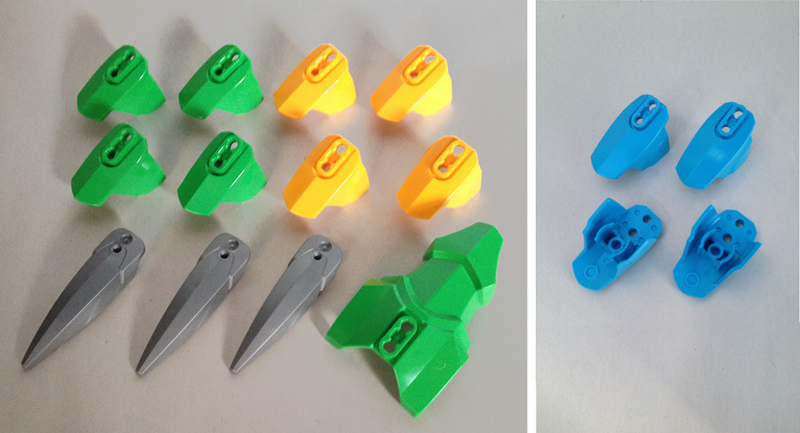 Even though its Design ID and Element ID are unchanged from a version of the part that has been appearing in Ninjago and Castle sets since 2011, it is the flat-bottomed variant that first began appearing in 2012 sets, so it can be attached to a hollow stud. Neat! Unlike Kopaka, the construction of both Lewa and Gali actually begins with the legs, then the torso beam. The gearboxes aren’t constructed until the legs are fully armored. Lewa’s gearbox is particularly unique. Both of the arms are geared to the yellow gear on the back, but additionally, mounting points are added to the back for his shoulder armor. Also, since his gearbox is mounted even higher on the torso beam than Kopaka’s was, and since his function has to support the weight of not one but two weapons, each shoulder gets two Dark Stone Grey eight-tooth gears and a Bright Blue friction pin to create sufficient friction. One of the three 7M talons is attached as back armor before his gearbox is even attached to his torso. Gali’s gearbox feels more ordinary at first glance. The eight-tooth gears and friction pin are centered behind her neck rather than mounted under her shoulders. And like Kopaka’s gearbox, only one shoulder is geared — the other is locked in place with a Medium Stone Grey [TLG]/Light Bluish Gray [BL] Technic steering arm. 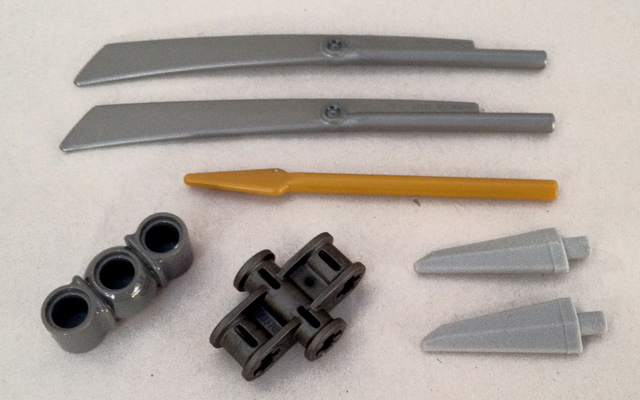 However, the 7M axle in the center is longer than the axles used for most of the Toa, and after attaching the gearbox to the torso beam the reason becomes apparent — another pair of eight-tooth gears and another friction pin are mounted in front of her torso beam, behind her torso shell! This trait is unique to Gali, but it makes sense, as her weapon in Battle Mode is easily as heavy as both of Lewa’s weapons combined, requiring at least two pins’ worth of friction. Other than the gearboxes and Lewa’s shoulder armor, the sets are no more complex than what you’d expect for a $15 set with less than 90 pieces. The arms and legs snap together very quickly, and an experienced builder will be able to build these parts of the model without even using the instructions. Thankfully, the variety in their armor and weapons still results in what I consider a very enjoyable building experience. The fully assembled Lewa set is truly a sight to behold! Swinging two battle axes, he seems ready to clear a path or defend himself in even the densest jungle. His gearbox is raised so high that his shoulder joints are level with his neck joint. Combined with his lanky arms and legs, this gives him a bit of a simian appearance. Both he and Gali have shoulders two modules narrower than Kopaka. The talon pieces used as shoulder armor do a great job filling out the extra height of his torso, though the single talon used as back armor still leaves his lower back fairly exposed and results in a considerable gap from side view. Lewa’s color scheme is very exciting, and generally very cohesive despite the use of both Bright Yellow and Flame Yellowish Orange. My biggest criticism of Lewa’s design is that his head doesn’t have a huge range of movement. The raised gearbox limits his ability to gaze upward. His head still has plenty of side-to-side movement, though. 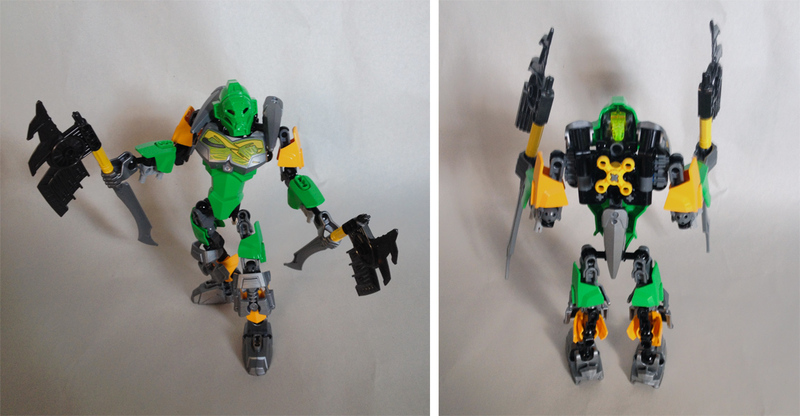 In Adrenalin Mode, Lewa attaches his axe blades to his arms to become his X-Glider (yeah, I don’t entirely get the name, either), and the handles become a pair of swords reminiscent of the Lewa Nuva set’s Air Katana. The effect is more impressive than the box art and teaser pics on the LEGO BIONICLE Facebook page led me to anticipate. The turbines on the axe blades suddenly make a whole lot more sense! The main criticism I have of Lewa’s Adrenalin Mode is that when you actually have him in a gliding pose, his gear function makes his glider wings move in a sort of silly way, resulting in the awkward look of the aforementioned box art and teaser pics. I suppose by turning the gear on the back less aggressively you can give the appearance that he’s banking in one direction or another. Also, since the head cannot tilt upward, he can’t stretch his body out horizontally while gliding and still keep watch in front of him. Gali differs from the other two Toa I’ve built in that the instructions tell you to build her in Adrenalin Mode and then show you how to convert her to Battle Mode. But for comparison’s sake I’ll look at Battle Mode first, as I’ve done with the others. In Battle Mode, Gali’s wields the Elemental Trident (somewhat of a misnomer, since it’s really more of a double-bladed axe). It makes her look extremely powerful, although when using the Battle Arm function, the inertia of such a huge weapon is a bit much for the ball joints in her arms. But of course, that couldn’t be helped without adding high-friction ball cups, which would not lend themselves to such nice proportions in my opinion. Since seeing the sets at New York Comic Con, Gali has been my favorite, and actually building her has not changed that one bit. Her color scheme is well organized, and her design feels remarkably feminine to me. It’s helped by the streamlined design of the armor shells on her thighs and shins. You’d think such bulky shoulder armor would give her a masculine appearance, but seeing it in person I actually feel like it really helps her appearance — don’t ask me why. Of the four different Gali sets there have been over the years, this design is by far my favorite! Switching to Adrenalin Mode repurposes the two giant axe blade pieces as Shark Fins for her feet, while the handle and the bladed lower end become a Power Harpoon (which is ironically more of a trident than her Elemental Trident was). This more slender weapon feels much better suited to underwater combat than the massive Elemental Trident did, and the flippers fit her feet very nicely. Interestingly, instead of using one red pin pointed inward towards each flipper like in Battle Mode, the instructions show both red pins on the right flipper, pointed left. This seems to confirm my suspicions that she’s meant to be able to join her two flippers together into one mermaid-like tail fin. Unlike Lewa, Gali’s head can tilt upwards with ease, which really lends itself to great swimming poses. The same sleek, streamlined armor design that helps her to appear so feminine also helps her look like she could cut through the water with ease. It’s no wonder her character page on the BIONICLE website boasts that she has “the ability to out-swim any known creature”! The Skull Spiders can of course latch to the heads of either of the Toa to control them. 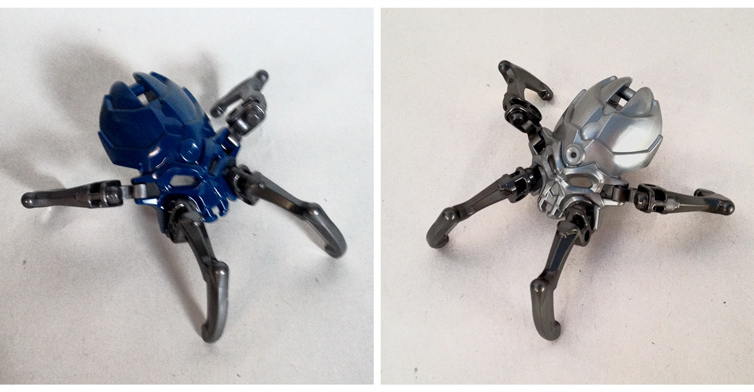 Gali’s Skull Spider actually matches her color scheme pretty well, while Lewa’s contrasts with his color scheme. I’m not entirely sure which I like better. A matching color is more photogenic, but a contrasting color makes the spider stand out and results in a more eerie, unnatural appearance. Even just taking these photos it was clear to me how much play value the ability to turn a hero into a villain stands to offer. I tried to evoke the altered personality of their Toa through their body language. As always, a quick strike to the back of the eye stalk will dislodge whatever mask or Skull Spider is attached to the Toa’s face. Incidentally the original BIONICLE storyline often showcased Lewa’s recklessness by having him jump headlong into dangerous situations and end up mind-controlled by the baddies. According to Lewa’s new character page, the 2015 Lewa is just as reckless, so the chance that a Skull Spider might steal his mask and taking over his mind in the new story is a very real possibility! The new Lewa and Gali sets measure up really well to the originals from 2001. Their proportions feel more natural and more varied, and their color schemes are brighter and more complex. At 25 modules tall, they also stand three modules (about one inch or two and a half centimeters) taller than the original Lewa and Gali, and have thirteen points of articulation instead of eight or fewer. Of course, these are $15 sets instead of $7 sets… but even so, they have close to the same price-per-piece as those classic sets even without adjusting for inflation (the price per piece is slightly lower than the originals in USD and slightly higher in GBP). The original Gali set had both shoulders geared, while the original Lewa had just the right arm geared. Ironically, the functions have switched for the new sets. The original Lewa also used a non-friction Technic pin to attach his left arm, meaning that BOTH arms would dangle when on display. Thanks to the use of friction pins in the new sets and the locked left arm of the new Gali, this is no longer an issue for either of the new sets. 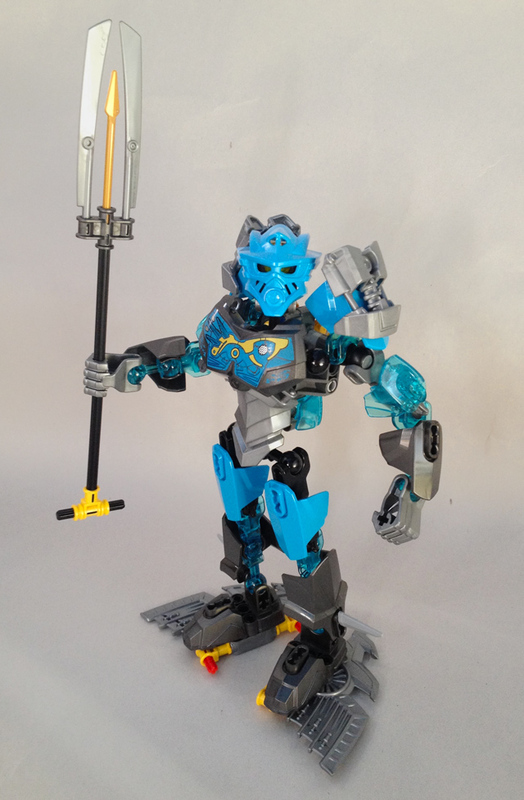 Gali’s new tools are a far cry from her classic hooks, but as mentioned above, they closely resemble the Aqua Axes of her 2002 Toa Nuva incarnation. The Adrenalin Mode of both sets echoes the dual functions of their Toa Nuva weapons — Gali Nuva could attach her Aqua Axes to her feet as flippers, and Lewa Nuva could hold his Air Katana at his sides to function as glider wings. However, the designers took great care to ensure that neither of the Toa was unarmed in Adrenalin Mode. 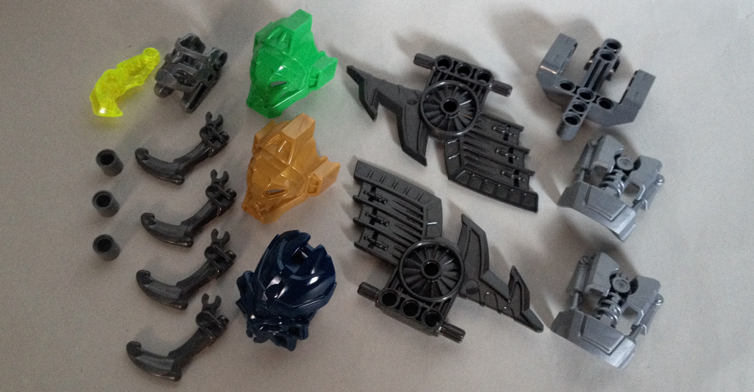 The instructions and packages illustrate how the Toa can “power up” with the corresponding Protectors’ weapons. I will be going into more detail on these models in my next review, but you can get a good feel for the changes just from these pictures. Lewa’s “powered up” design is basically the same as his Adrenalin Mode, except the shoulder and torso armor of the Protector of Jungle is placed on his shoulders and his swords are swapped for the Protector’s Air Elemental Flame Bow. Also, although not pictured in this booklet, I’ve been informed that the instructions also dictate moving the vines from the Protector of Jungle’s feet to Lewa’s. It definitely feels a lot less cluttered and awkward than Kopaka’s “powered up” form, though it’s no more complex and still leaves me hoping there will be other, more elaborate combi models as well. Gali’s “powered up” design is my favorite of all the ones I’ve seen so far. Gali wields the Protector of Water’s Elemental Torpedo Blaster, which is combined with her flippers/axe blades as fins. She also swaps the shells on her upper arms for the turbines from the Protector of Water’s upper arms. And instead of simply throwing her harpoon aside like Kopaka does with his shield or Lewa does with his swords, the upper half is placed through an axle hole of the ball cup connected to the turbine on her left shoulder. 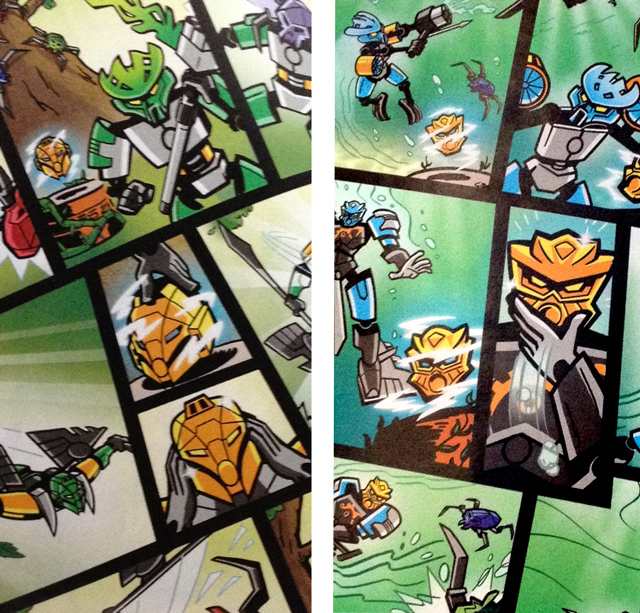 The Toa each star in a ten-panel, dialogue-free comic featured on the first page of their respective instruction manuals. The story is roughly the same for each Toa. The Protector is defending the golden mask from a group of Skull Spiders, but a Skull Spider manages to latch onto their face. A Toa rushes to the scene in Adrenalin Mode, then switches to Battle Mode to dispatch the spiders and free the Protector. The grateful Protector then allows the Toa to “power up” with their weapons and the golden mask. As storytelling goes, it’s nothing complex, but it does have a clear beginning, middle, and end, plus manages to efficiently illustrate all of the set’s functions in the distinctive style that will be shared by next year’s BIONICLE webisodes. Overall, I’m extremely pleased with both of these sets! 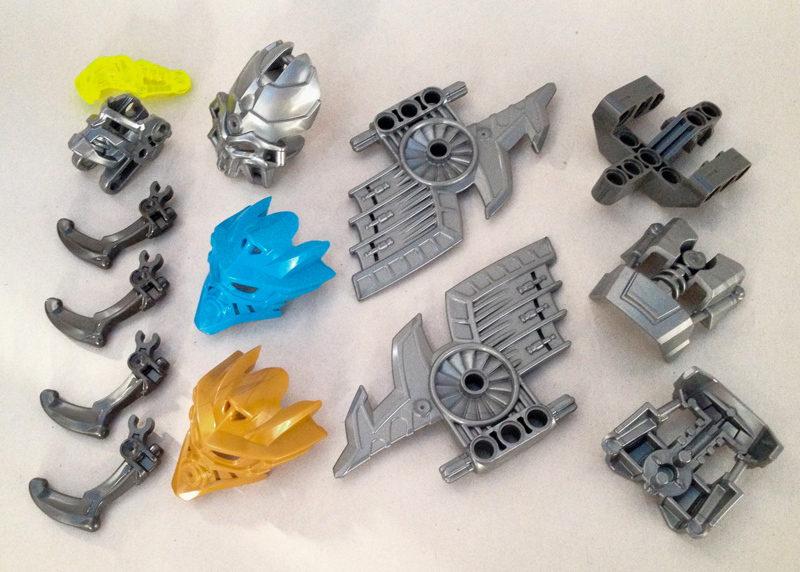 I think they are a great taste of what the new BIONICLE theme has to offer, and a great value for money. 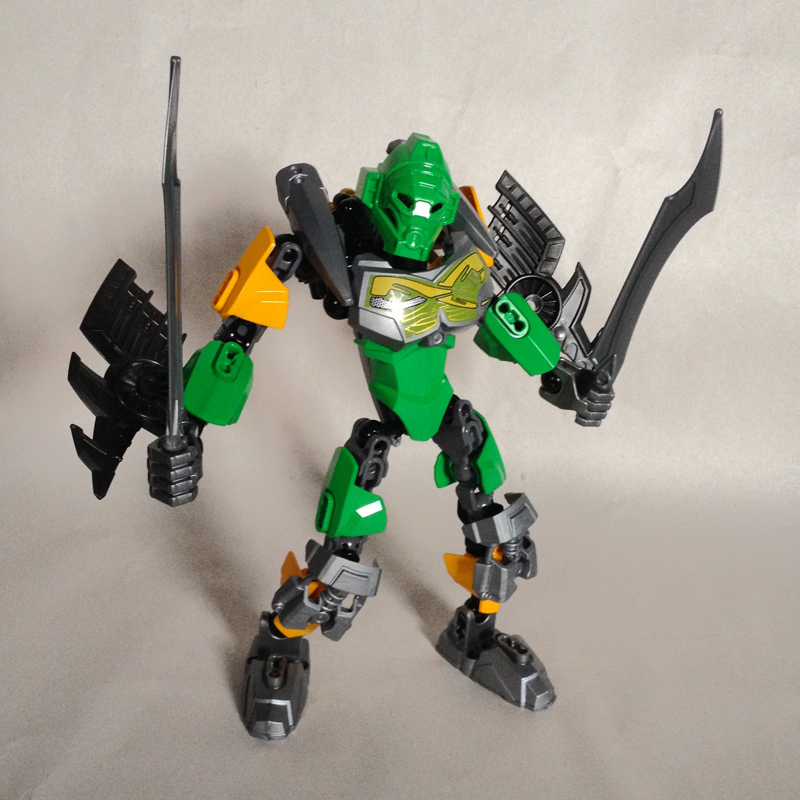 Gali remains my favorite of the new Toa, and Lewa is one of the most unique of the six in terms of his armor and body proportions. 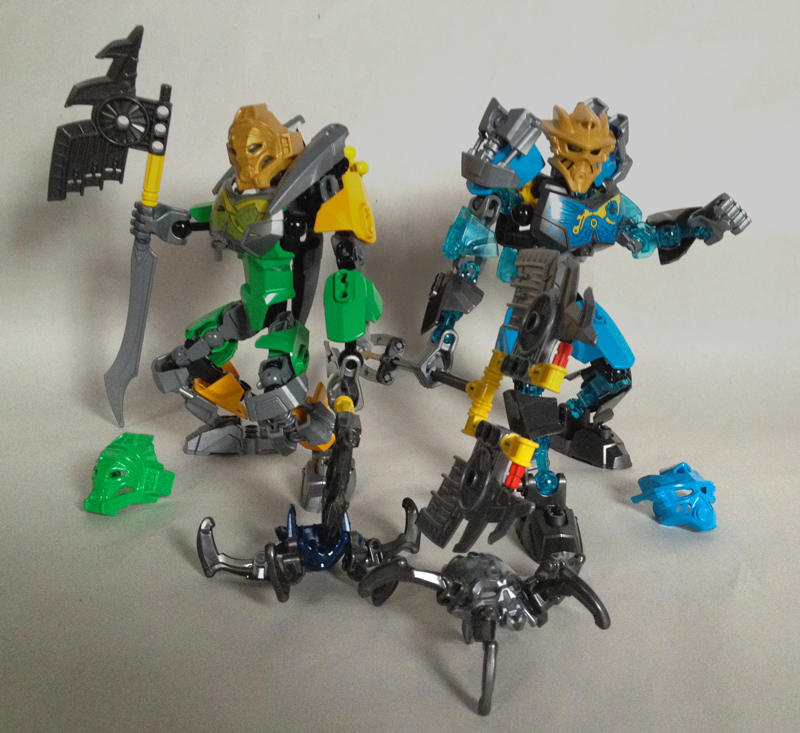 I definitely recommend them to any BIONICLE fan or any LEGO fan that wants to dip their toes in the water of the constraction (buildable action figure) category. 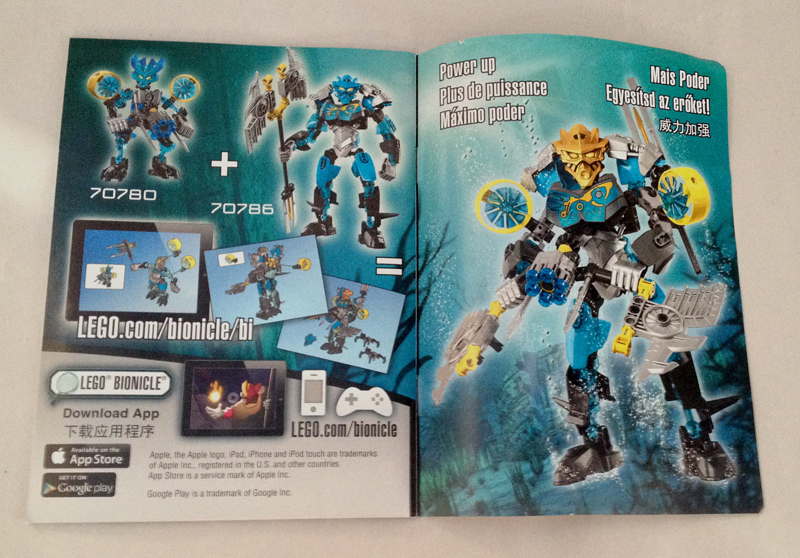 70784 Lewa Master of Jungle and 70786 Gali Master of Water will retail at $14.99 USD/£12.99 GBP when they are released on January 1, 2015. Consider using our affiliate links to buy them (or anything); this helps support New Elementary! Great review! Of the six toa, Gali and Lewa look to be the best bang for your buck. Pohatu is similar, but seems a bit stripped down, lacking shoulder armor, but he has nifty colors. 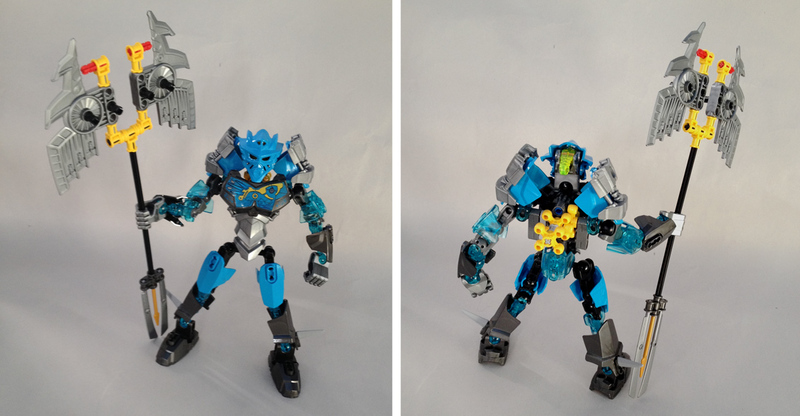 Kopaka and Onua look like great bigger sets, but Tahu seems to just be a copy of Gali with more armor and bigger weapons. I'll probably get at least these two, a couple of protectors, and LOSS, because while his function and appearance are kinda meh, he has some pretty great parts. Hi! Of the six, the only two I currently have are Gali and Tahu. I can attest that the two sure feel different, with Tahu having a bit more height, and shoulder armor that angles out, giving him a more muscular feel. His calf armor is also very thick, and the overall result differentiates him quite a bit. While I'd call Tahu the most "generically heroic" shape, all six Toa have unique enough builds to make each stand out in their own way. Define "module". Is it essentially the same as the thickness of a brick but you use different terms because Hero Factory didn't use "bricks"? Also, the 6221 hub that you cited looks like it's probably the collar that goes into one end of the old pin connector (75535). That was a two-piece construction that had to be fused together to get the interior groove that pins lock into, but has since been replaced by 62462, which uses a gated mold to form the interior groove from the side. In all likelihood, 6221 is officially retired along with 75535. The term "module" is the reason why many official part names use "M" where the Bricklink part names might use "L" (for "length"). I knew that 6221 was probably retired (it hasn't been in sets in many years, and this new bushing seems to finally formally replace it. But I never even considered that 6221 might have been one of the components used to construct 75535! Well, keep in mind that "module" is not common lingo. Just a quick tip at the beginning of an article could save lots of confusion (then again, many people might just look at the subject and pass it by). I was pretty big into Bionicle, but we didn't have access to internal databases back then, and Hero Factory did absolutely nothing for me. 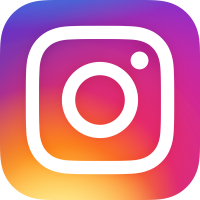 The "M" probably stands for the Danish equivalent of the word "module", and not actually "module" itself. That's the case with "Q" elements (have no idea what actual word that refers to) and "K" box sizes. 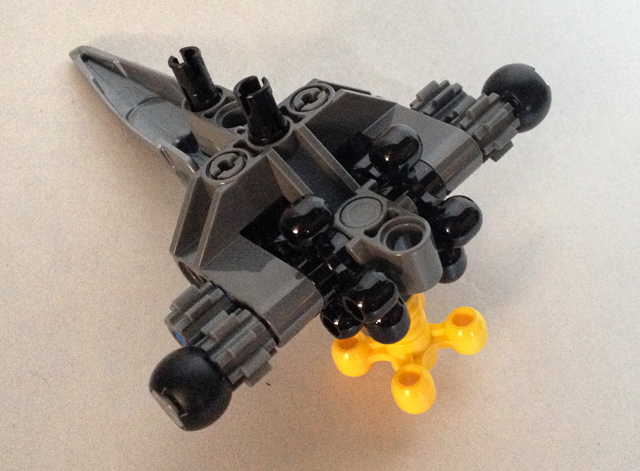 The 6221/75535 bit came up recently on Bricklink, as someone who collects oddball parts managed to get his hands on one and wanted to know if someone could supply the outer shell (not realizing the inner collar was used by itself while the shell was not). Awesome shots! Gali was my first Toa, and for the relaunch I'll definitely grab her first as well! What are your personal thoughts on the use of the same chest piece as in the Super Heroes and Legends of Chima lines? 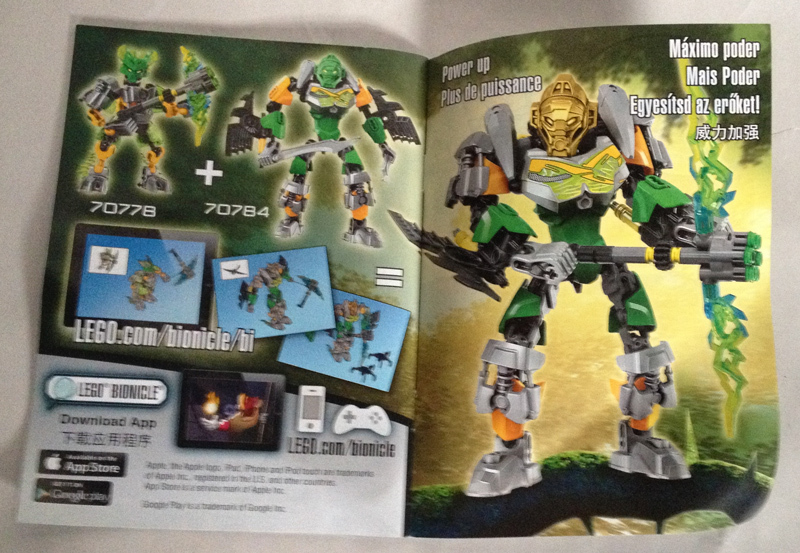 The latter is getting a new chest design in Wave 2, so Bionicle may follow that trend its second year. It just feels strange that for such a powerful brand, The Lego Company did not see fit to make new chest pieces for the debut. I mean, Onua looks exactly like Chi Gorzan, and I'm a bit afraid to display them on the same shelf. I really like the use of the chest piece, especially with this ornate printing. The shape is great and I love its smooth texture. I would not complain if a new chest piece were introduced in the future (perhaps something with molded vents, like the larger chest plate used for Onua), but hopefully if we do get one it will still be plenty versatile and not so specialized that it's ONLY suitable for BIONICLE. In general, I'd like to think that with this building system we've moved past the need for each theme to have its own entirely separate system of parts. Having a few theme-specific parts, like masks, weapons, and occasional details like the new piston shell detail or the Legends of Chima torso shell is fine. But I don't think there's any sense in introducing new parts just to avoid using parts that were originally introduced for another theme. After all, a lot of current parts like basic shells or the Super Heroes chest plate were designed to work for multiple themes from the start. Over time I'm sure we will see more parts being introduced specifically for the BIONICLE theme. However, I don't think there's any rush, and I don't want things to get out of control. This first wave of sets has done a good job demonstrating that you CAN make unique models even while relying mostly on pre-existing parts. Well, darn it. Originally, I felt that Lewa was the "least good by default of the rest being more unique" one, but your in-depth look has sold me on him. I love how the spikes bulk out his shoulder area. Looks like I'll end up with all six after all!